Is this the REEL deal? Groupon and similar deal sites are great for finding discounts on products and services, but you are bombarded with offers for restaurants and cleaning services, and very rarely see an offer tailored specifically for boaters and fishermen. By contrast, the first thing you usually see when you visit reelfishdeals.com is an offer on the homepage for fishing or boating gear, often for 50% off or more. Each day one exclusive partner is featured, but you have to act fast before the offer expires. 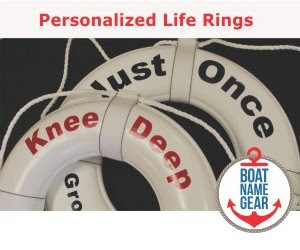 When we checked out ReelFishDeals last week, they were featuring half price gift certificates for personalized gear from our friends at Boat Name Gear. Not bad. Other offers on the deal site have included fishing jigs, lures and, of course, rods and reels that are listed at prices that claim to range from 30 to 50% off list price. As the site's following grows, and more boating and fishing gear retailers find out about it, there will surely be even more appealing deals offered on the site. 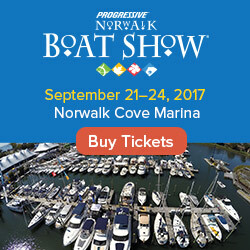 Competitors may even pop up catering our market, which could lead to even more deals for us boaters and anglers. But ReelFishDeals seems to have gotten a jumpstart on the competition. They have already received the attention of industry publications such as Soundings Trade Only, as well as major newspapers like the Miami Herald. With press like that, may be seeing a lot more savings on boating and fishing gear in the foreseeable future. The bottom line is, if you want local deals on a hodgepodge of stuff like restaurants, getaways, retail stores and events, you should check out Groupon or one of its many competitors. 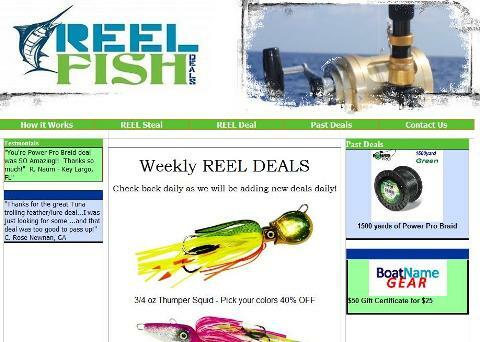 For deep discounts on boating and fishing products, there appears to be only one game in town: ReelFishDeals.com.